Tally Ho Ale and Beer: (Sept/2011) Per Will Anderson, the brewery was in Ridgewood, Long Island on the Queens side of the Queens/Kings (Brooklyn) border going along Cypress Ave. 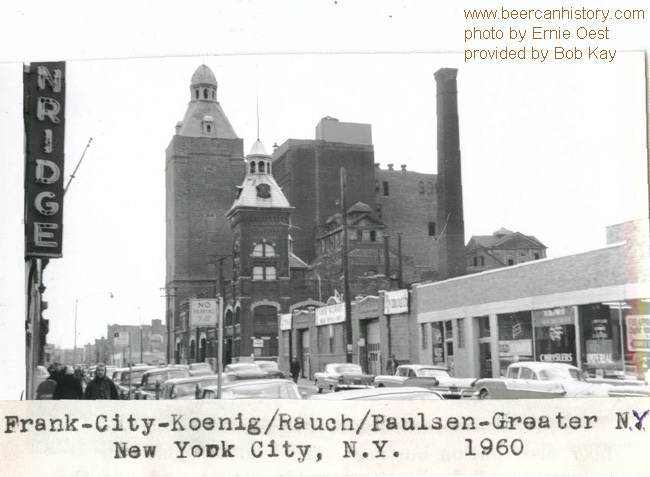 This brewery originally had several other names, such as the Frank Brewery, but in the 1920's became The City Brewing Corp. After Prohibition new management of John Koenig, President, Henry Rauch, Treasurer, and Frederick Paulsen, Secretary started brewing and selling under the Tally Ho labels. In earlier variations of the brands, their names were prominently shown on the can's front. During the years before World War II, Tally Ho was distributed widely around Brooklyn and Queens, including sales to South America and the Philippines (one withdrawn free cone for a 3rd variation of the beer was apparently found by Clay Tichelar #701). In 1941, the brewery name was changed to Greater New York Brewery due to a merger, after which a number of other brands were emphasized. Sales were lost during the 1949 New York City beer strike, and the brewery discontinued in 1950. Tom Leo first heard about this Tally Ho Ale example in the early 1980's which had been found by a long time collector from Liberty, NY who found it in the Catskills. It was placed in a Paul Michel auction and bought by a Texas collector. 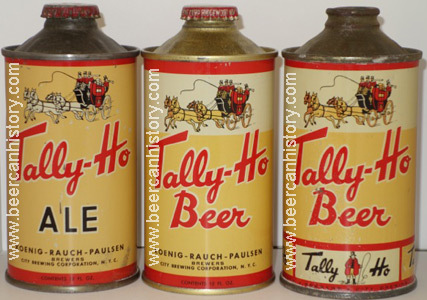 Another example of the Tally Ho Ale was recovered from trash during the 1980's in Long Beach, Calif., along with over 30 early Calif. and New York area cans such as Doelger Bock, etc. However, due to very poor storage most of these cans were grade 3 when examined by Gene DiCicco around 2002 prior to their sale. Most of the other Ale examples found, so far, have been other dumpers, including a grade 2-ish Tom Leo had. Copyright © 2007-2012 www.beercanhistory.com, All Rights Reserved. Last modified June 25, 2012.